Blake Bortles passes for 377 yards and four touchdowns in Jacksonville's 31-20 win. JACKSONVILLE, Fla. — Eight months later and with much less on the line, the Jacksonville Jaguars found a way Sunday to close out Tom Brady and the New England Patriots. Blake Bortles threw four touchdown passes, three in the first half, and the Jaguars beat Brady and the Patriots 31-20 in a rematch of last season’s AFC championship game. The victory – Jacksonville’s first in nine tries against Brady – could signal a new favorite in the AFC. He threw three TD passes – to Donte Moncrief, Keelan Cole and Austin Seferian-Jenkins – in the first half, the second time Bortles has accomplished that feat. Bortles sealed the victory with a 61-yard pass to Dede Westbrook in the fourth quarter. Westbrook took a short pass on a crossing route, made one defender miss and outran another down the sideline and into the end zone. Cole delivered the key block. Cole finished with seven receptions for 116 yards and a score. He made a spectacular one-handed catch on Jacksonville’s second drive and beat Eric Rowe for a 24-yard touchdown three plays later. Rowe was then benched. 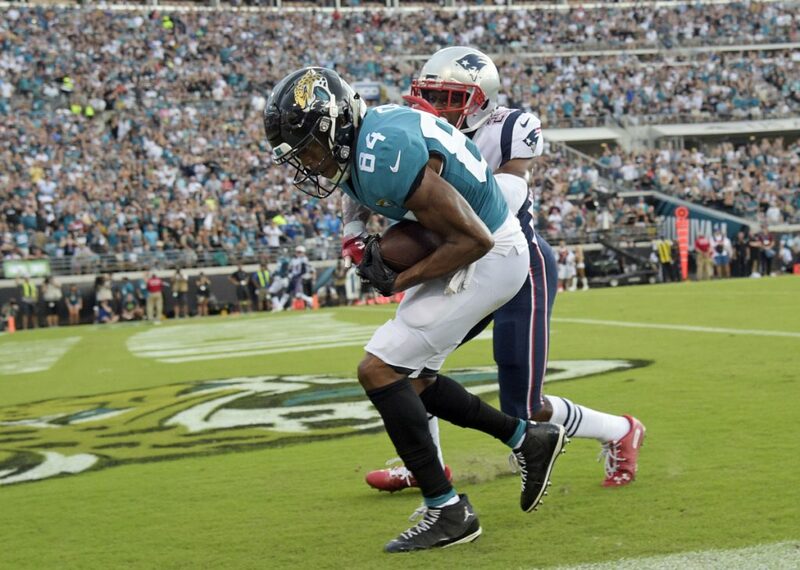 Westbrook’s catch-and-run put the Jaguars (2-0) ahead 31-13, allowing them to start celebrating their second victory in franchise history against New England (1-1) and first in the regular season. They hadn’t beaten the Pats since January 1999. Brady pleaded with teammates on the bench early. Offensive coordinator Josh McDaniels also appeared to deliver stern words. Just when the Patriots started showing signs of life – they were down 11 and in field-goal range early in the fourth quarter – Dante Fowler stripped Brady. Fowler was making his season debut after being suspended for the opener. Unlike the previous meeting, Jaguars Coach Doug Marrone didn’t sit on the lead late. Jacksonville kept throwing, even in the final minutes, and put it on the offense to close the game. Marrone was widely criticized for getting conservative in the AFC title game. The Patriots trailed 20-10 in the fourth quarter of that one before rallying to win 24-20 and advance to the Super Bowl. The teams played in the hottest game in Jaguars history. The temperature at kickoff was 97 degrees, with a heat index of 107 degrees. According to the NFL, it was the warmest game since Green Bay played at Arizona in 2003. The Jaguars improved to 4-0 in two seasons without running back Leonard Fournette. He sat out while recovering from a sore right hamstring that was tweaked in the opener at the New York Giants. Patriots rookie Sony Michel, a first-round draft pick from Georgia, carried 10 times for 34 yards in his NFL debut. Michel is expected to give New England some much-needed help in its running game. Patriots: Defensive end Trey Flowers and safety Patrick Chung, two of the team’s top defenders, left the game because of concussions. Flowers was injured in the first quarter when he collided with teammate Keionta Davis. Chung was injured in the second half. Jaguars: Left tackle Cam Robinson left in the first quarter after injuring his left knee and later was ruled out. Receiver Donte Moncrief, who caught a touchdown pass on Jacksonville’s opening drive, left because of a knee injury in the third quarter. Defensive end Calais Campbell, questionable to play because of a sore right knee, left after getting poked in his right eye. He later returned.